When she was just seven years old, Laxmi’s life changed drastically. Her parents took her out of school and sold her to the local temple where she was dedicated as a Jogini (temple prostitute). Very quickly her life became one of duty to the temple ‘goddess’ and, when she was older, her duties extended to serving local men, performing any sexual acts they demanded, unable to turn any man away. Even though the practice has been illegal in India for 30 years, little has done by law enforcement to curb it, particularly in rural areas. This is why, in one State where Freedom Challenge is supporting an anti-human trafficking project, there are 80,000 women enslaved as temple prostitutes. A Jogini’s life is indescribably hard. Joginis are not allowed to marry and due to the nature of their work they are prone to serious disease; they are 10 times more likely to die from HIV than any other women in India. Unsurprisingly 93% are illiterate, but what is perhaps even more concerning is that 92% are clinically depressed and 57% have attempted suicide. These women have lost all hope. But that doesn’t have to be the end of their story. 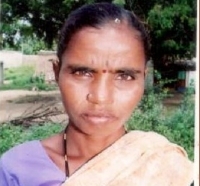 Laxmi was 35 when our project workers visited her village for the first time. They explained to her that it was possible for her to leave, that she could be free, that she didn’t have to suffer any more – words that Laxmi could scarcely believe. Laxmi was given all the help she needed to overcome her fear of leaving. Today, five years later, she is completely unrecognisable from the woman she once was. Her past has given her a passion and determination to see other Jogini women set free. Now she works with our project to teach local communities about the reality of the Jogini system, and she meets government officials to lobby for the rights of women trapped in such an horrific form of slavery. What’s more, in 2015 Laxmi was given an award by district government officials for her role in stopping the dedication of a 12-year-old girl. And recently she was elected as a council member for her town. This is a story of true transformation – and it’s one that your support has made possible. We long to see these oppressed and forgotten women experience freedom, love and compassion in the same way that Laxmi has. Will you help rescue more women and children like Laxmi?